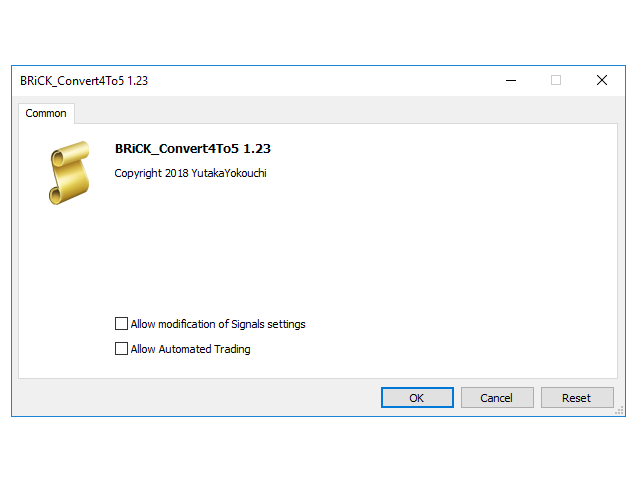 * This product was converted using "BRiCK Convert4To5 MT4" based on the MQL4 source file of "BRiCK Convert4To5 MT4 Free". "Convert4To5" is a Script that converts MQL4 source files into MQL5 source files. Experts, Indicators, Scripts, and Libraries with extension ".mq4" will be available for MT5. 1. Open the following folder. 2. Confirm that the BRiCK_Convert4To5 folder exists. 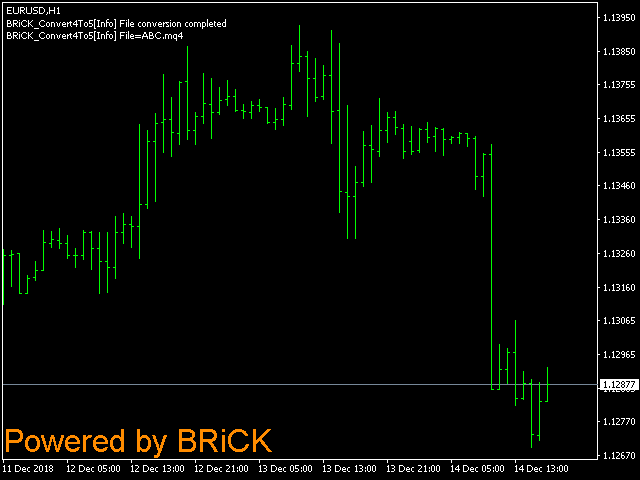 If it does not exist, insert a script "BRiCK_Convert4To5" into an arbitrary chart and create a folder. 3. 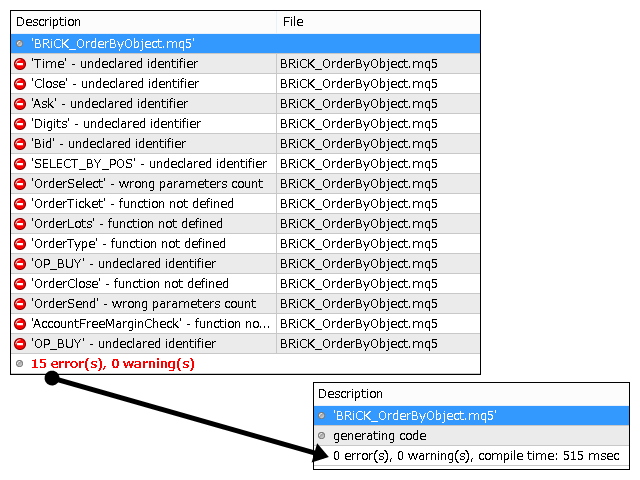 Place the source file whose extension is ".mq4" in the Input folder under the BRiCK_Convert4To5 folder. 4. Insert the script "BRiCK_Convert4To5" in an arbitrary chart. 5. Open the Output folder under the BRiCK_Convert4To5 folder and check that the file with the extension ".mq5" has been created. 6. Compile the created MQL5 source file with a MetaEditor. 7. Make sure that it compiles normally. Please correct yourself if an error occurs. 8. Test that it will be the expected movement. - The difference between the product version and the free version is as follows. - This product does not guarantee perfect conversion. I have released it since testing the conversion, but it may not be able to convert properly depending on how you write the source code. - You can not refund or return items. Please confirm with the free version in advance. - Direct or indirect loss due to using the product is not guaranteed. - It may not be converted as expected due to differences in terminal version or build. - Multiple files can not be converted at the same time. Place only one file in the Input folder. - It is necessary to match the data type defined by the function with the data type of the argument when calling the function. - Conversion of include files with the extension ".mqh" is not supported. Paste the code into a file of ".mq4" format and convert it. - The conversion logic assumes the MQL4 source file created after build 940. - Event functions init, deinit, start are deprecated. It is necessary to describe the main process to OnTick for experts, OnCalculate for indicators, OnStart scripts. Refer to the reference for the transition from MQL4 to MQL5. - Be sure to use "#property strict" before conversion of MQL4 source file to make sure there are no potential compile errors. - The following functions can not be migrated because there is no corresponding function in MQL5. Returns a constant value to prevent compile errors. - Since the following functions result in override errors, they are replaced and output. - Since it is not implemented with variable length arguments, the number of arguments is limited for the following functions. - In MQL5, when the OrderSend function fails, I added "GetLastError_Trade()" because I do not know details with "GetLastError ()" alone. Please refer here for the return value.